Story: In 2016, the Key School student, Delaney Snowden, recruited four falls teams to participate in Play4TheCure and established “Marcella Yedid Athletic Week.” The event was named after the school’s former headmaster, Marcella Yedid, who died of colon cancer. For three years, Delaney structured the program and maximized success by organizing fundraisers, selecting game dates, and ordering Play4TheCure kits. Fundraising and awareness efforts included posting on social media, hosting bake sales, sending emails to the student body and creating posters. Since starting the event, Delaney and the Key School have raised $12,626. Latest: Delaney will be attending Haverford College to continue her field hockey career. She hopes that Marcella Yedid Athletic Week continues at the Key School for years to come. Story: Three years ago, after losing one of his teammates from his swim team to bone cancer, Michael was determined to be part of the journey to help find a cure to eradicate cancer. Michael decided to use his artistic talents to host a local neighborhood art exhibit. Recruiting other local students, ranging from 6th grade through 11th grade, these talented artists showcased and sold their artwork to raise funds towards cancer research. Latest: The inaugural Kenwood Blossom Art Exhibition raised nearly $6,000, with plans for another art exhibit planned this fall at the Landon School in Bethesda, MD. Story: Landon School student, Bruce Han, wanted to raise awareness and funds to support cancer research after losing his grandfather to cancer. Utilizing his musical talents, he formed a jazz band with other classmates from his school. 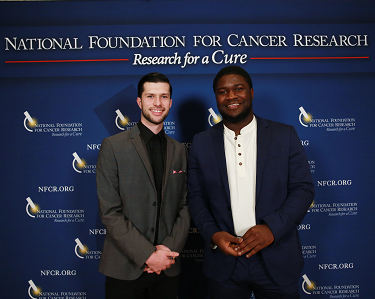 The Dodos Combo debuted at NFCR’s Annual Albert Szent-Györgyi Prize for Progress in Cancer Research Dinner and Award Ceremony in 2017. Latest: The Dodos Combo performs at various events in the Washington, DC area, while raising awareness and funds to support the work of NFCR. They have raised over $2,100 to date and will showcase their music again in 2018. After losing her grandfather to cancer, Ally decided to create a Play4TheCure® team to honor his memory. Her grandfather taught her baseball, so Ally partnered with minor league baseball teams from around the country and established cancer awareness-themed games. The games educated others about cancer and the research conducted by NFCR-funded scientists. Latest: In just two seasons partnering with MiLB teams, over $7,500 was raised to support Research for a Cure. Ally, a senior in high school, will be attending the University of Notre Dame this fall. Learn more: Check out Ally’s Crowdrise page. Story: After interning with NFCR, Nancy decided to make a difference in the lives of others and co-founded the Cancer Fundraising Club at Walt Whitman High School in Maryland. Latest: Nancy raised over $2,100 to fund cutting-edge research initiatives with her fellow Cancer Research Club members. She is now attending Cornell University for her undergraduate studies. Story: After her terminal breast cancer diagnosis in 2009, Lucy Stanovick created The Lucy Fund, in hopes to raise money for metastatic cancer research. After her death in 2012, her son, Nick, decided to continue his mother’s efforts. Nick and his committee planned and executed numerous fundraising events all over the east coast and they had the opportunity to intern for the National Foundation for Cancer Research in the summer of 2014. Latest: To date, The Lucy Fund has raised over a quarter of a million dollars for cancer research, something that has made everyone involved with The Lucy Fund incredibly proud. Getting started is easy! Just call us at (301) 654-1250 or email info@nfcr.org to let us know you’re interested in becoming a Youth Ambassador. A member of the NFCR team will help get you started in the program and help you brainstorm creative fundraising and recruitment ideas!